The blog-bot was designed by artist Kerrythe Mahaffey and she used inspiration from this blog to design him. Other than the obvious nuts and bolts for legs and the gear (a recurring theme on this website), can you figure out what the inspiration was? You’ll find the answers at the end of this post. I’m sure you didn’t find that too difficult. Our blog-bot needs a name. 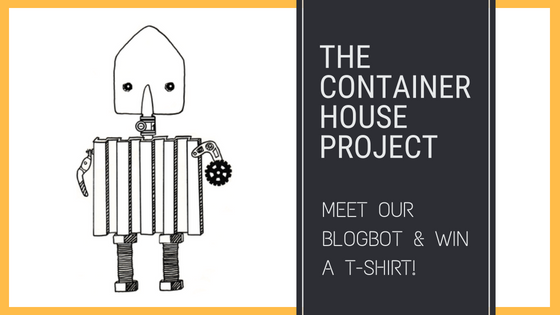 Leave a comment below with your suggestion and if we choose your suggestion as our blog-bot’s official name, we’ll send you a Container House Project t-shirt in your size. How cool is that? Please note that we can only ship to South African addresses. Therefore, only South African residents are eligible to win a t-shirt. We can’t wait to see your name ideas! Scroll down for the answers to the game above. Edit: We decided upon Bolt for our blog-bot’s name. Thank you to Judy for the suggestion!